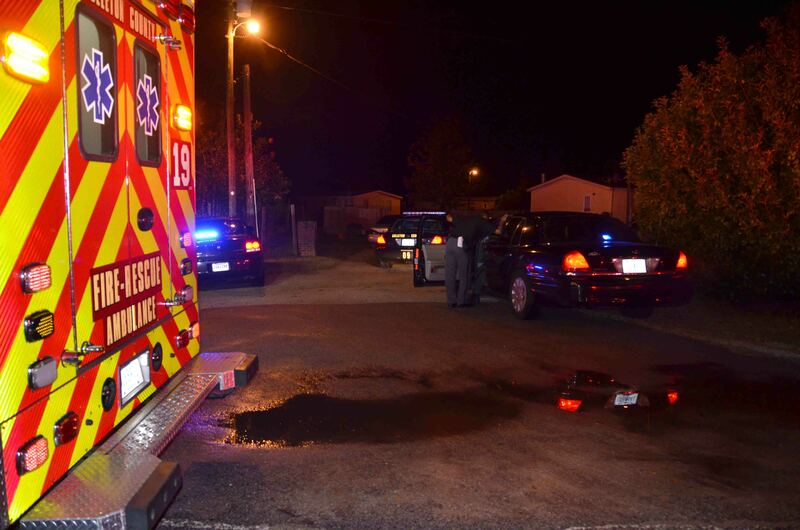 A 26 year old man received a single gunshot wound to the left leg Thursday evening 29-November. 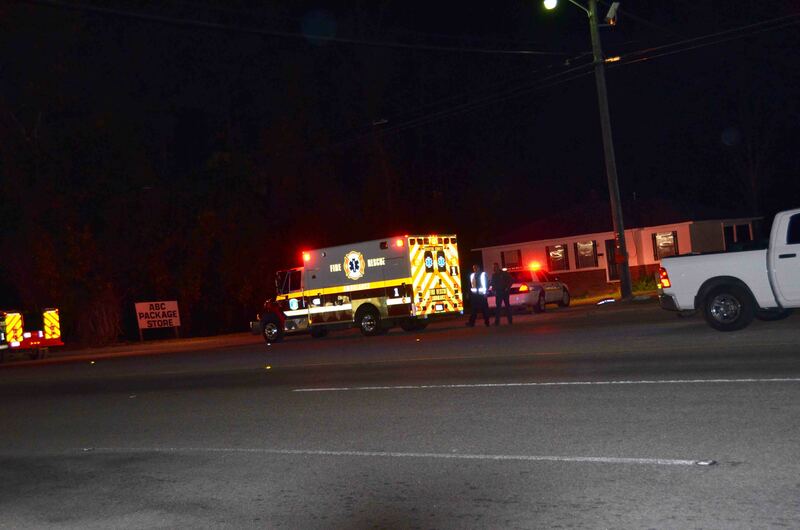 The incident occurred at 19:32 at Hosey’s Package Store located at 1210 Hampton Street in Walterboro. The front windows of the store were damaged during the incident. The man was stable at the scene and treated by Medic 1. He was transported to Colleton Medical Center for further care. Click here for more information. We wish to congratulate Station 2 Firefighter Michael Juhasz and his wife Jenny on the birth of their daughter Julie Anna Juhasz. Julie Anna came into the world five weeks early, but is doing well at St. Francis Hospital in Charleston. She weighed 4.5 pounds and is 18 inches long. Mom is doing great too. 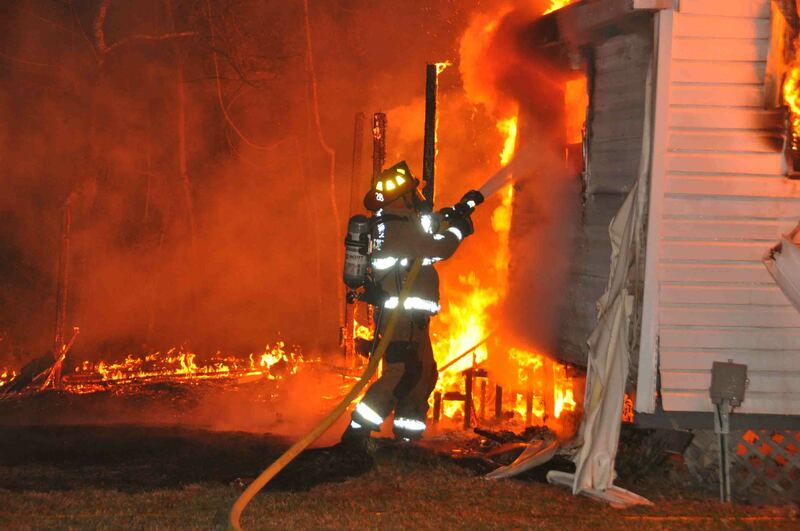 Two Smoak’s residents lost their home to a late night fire Wednesday evening 28-November at 23:44. They were awakened by their smoke alarms to discover a fire on the “B” side of their mobile home located at 96 Southard Lane east of the Town of Smoaks. The husband and wife were able to exit the home safely and went to a neighbor’s house to call 9-1-1. Click here for additional information. 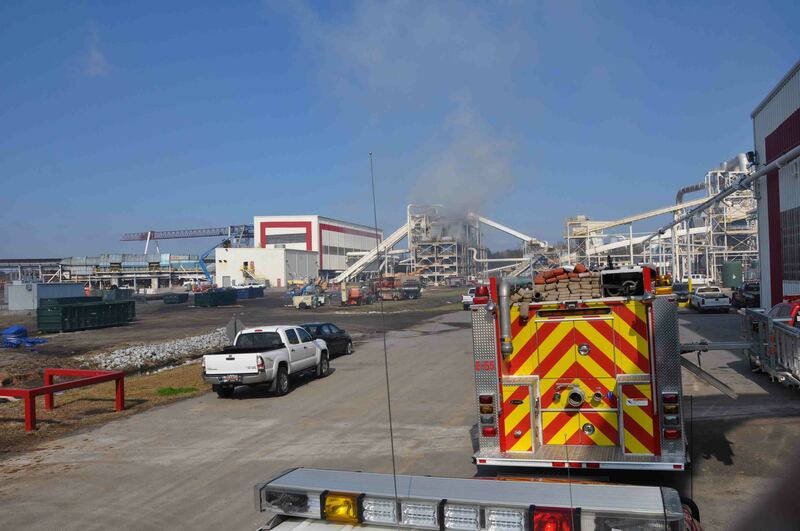 CCFR units responded to a mutual aid request for an industrial fire at the Georgia Pacific Mill on U.S. Highway 321 in Allendale County on Wednesday morning 28-November at 11:51. Car 118 responded with four personnel and arrived at 12:24 to find a very large industrial facility with smoke showing from multi-story chip hopper. The fire was confined but required extensive overhaul. Click here for additional information. A mobile home located at 23560 Augusta Highway received heavy damage in a late night fire Monday evening 26-November at 22:51. Engine 11 arrived to find heavy smoke conditions and fire coming from the windows on the “B” side of the singlewide mobile home. 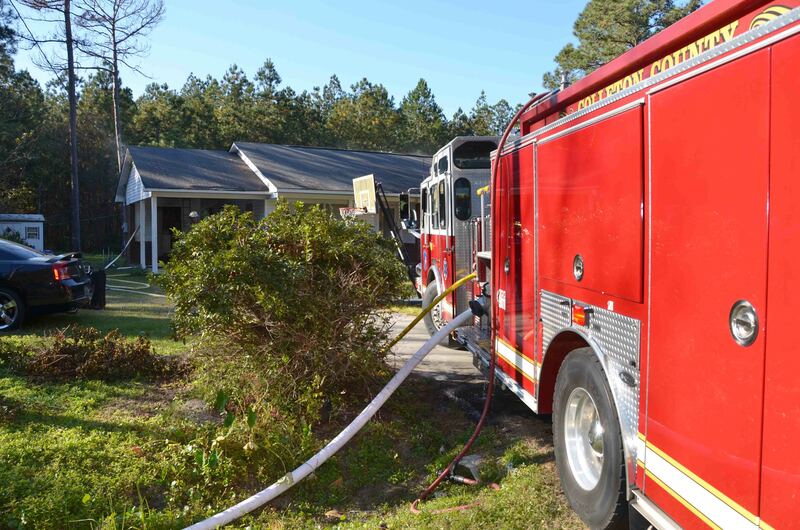 Crews deployed one 1-3/4 handline and quickly knocked down the fire containing it to the master bedroom. Click here for additional information. A large fast moving woods fire kept Firefighters busy for over two hours Friday afternoon 23-November. 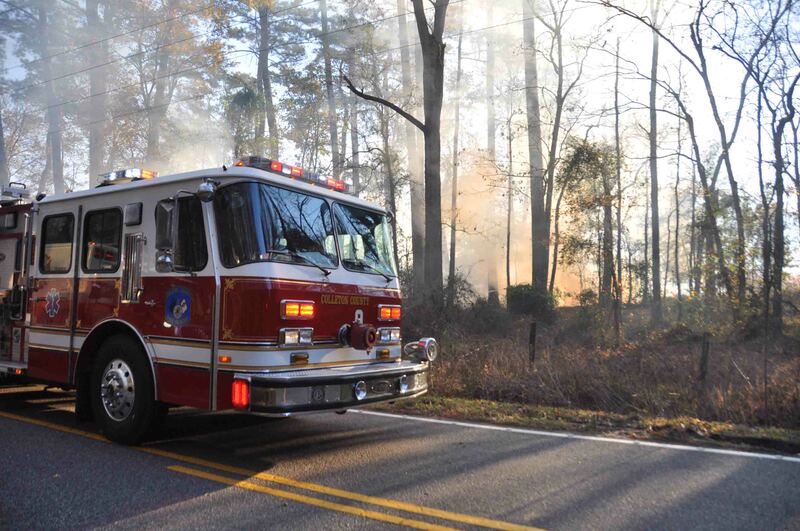 At 15:34, Station 9 was dispatched to a woods fire on Rehoboth Road (SC Hwy 651) near Timberbay Road. The fire was reportedly started by a piece of equipment. Engine 9 and Medic 9 arrived to find the fast moving fire in a broom straw field, endangering several homes. Click here for additional information. 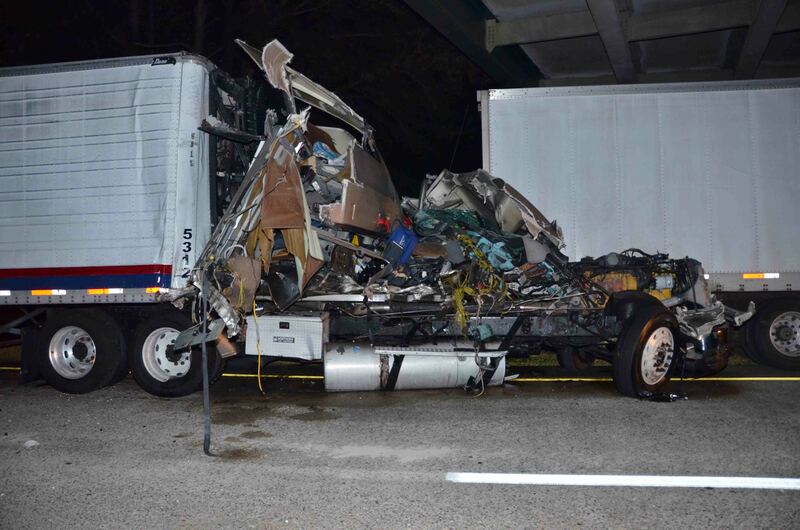 A truck driver was lucky to be alive following a crash on Interstate 95 at the 55 mile marker northbound Friday morning 23-November at 04:06. The 68 year old driver, who reportedly had never been involved in an accident during his career, left the roadway just north of the 55 mile marker. His rig struck the guard rail, taking out the majority of the safety device before plummeting down...click here for more info. Four people were injured, with two being transported to Colleton Medical Center following a five car accident on I-95 near the 64 mile marker southbound. 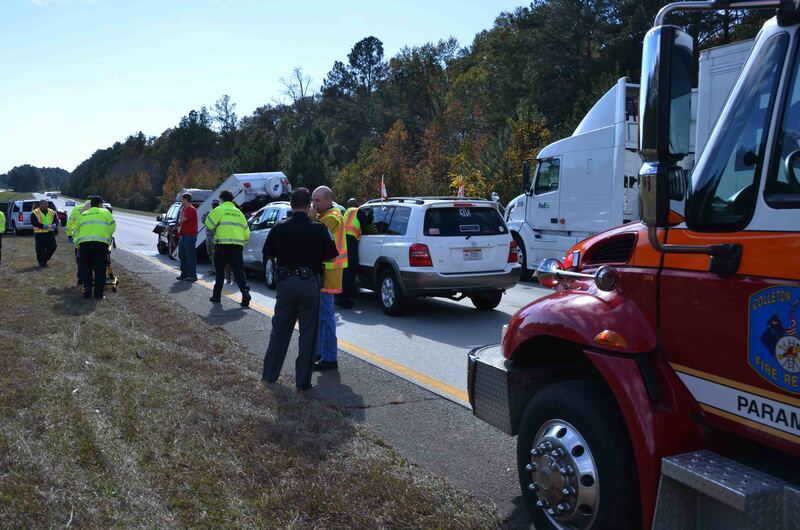 The accident occurred at 12:13, Wednesday 21-November, the day before Thanksgiving. Heavy traffic resulted in intermittent slow moving vehicles. At one point near the 64 mile marker several vehicles slowed....click here for additional information. 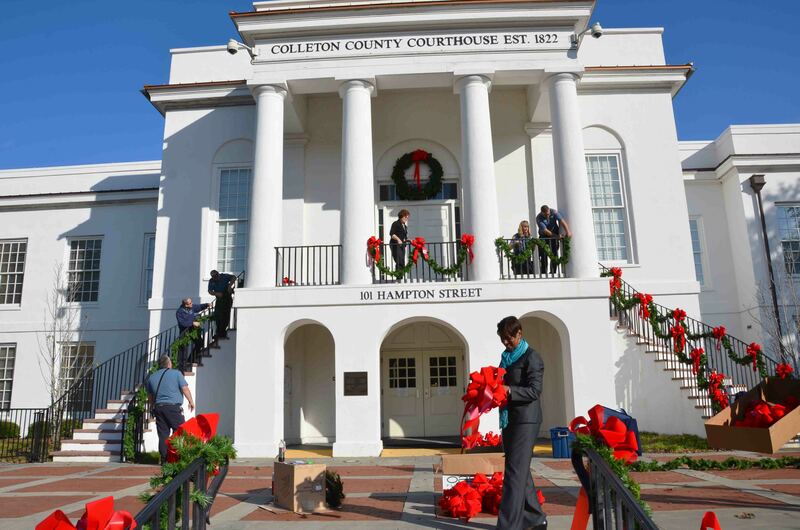 A dozen County Firefighters assisted Clerk of Court Pat Grant and her staff decorating the Historic Colleton County Courthouse for Christmas. This is the fourth year Fire-Rescue has assisted with the project, coordinated by Firefighter-Paramedic Pam Berry. Berry has the process down to a science now, taking less than an hour to adorn the recently remodeled building. Click here for additional information. 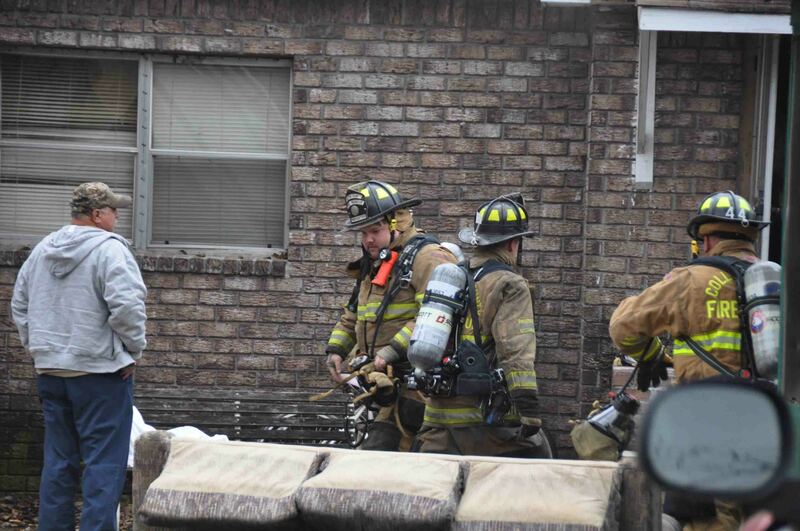 Three people were injured when a gas heater flashed after a resident attempted to light the device in a residence located at 8947 Augusta Highway in the Springtown Community. 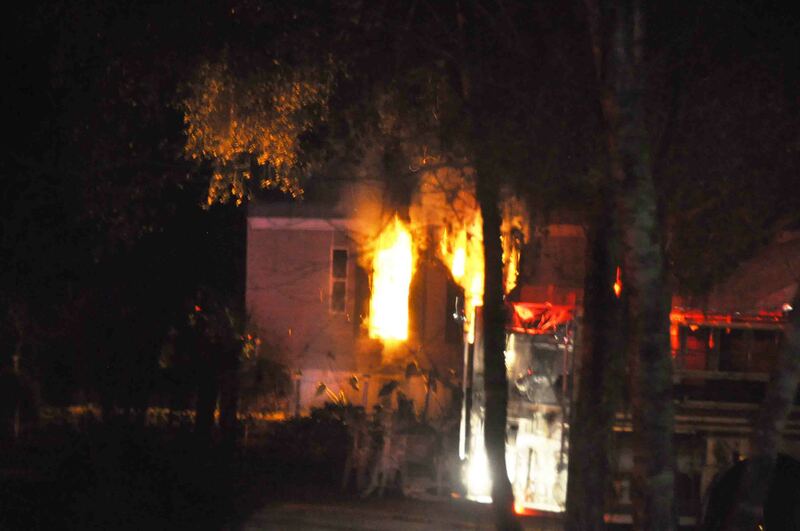 The incident was reported at 09:53 Friday morning 16-November advising the home was on fire. Engine 17 arrived within minutes to find light smoke showing from the single story brick veneer dwelling. Click here for additional information. 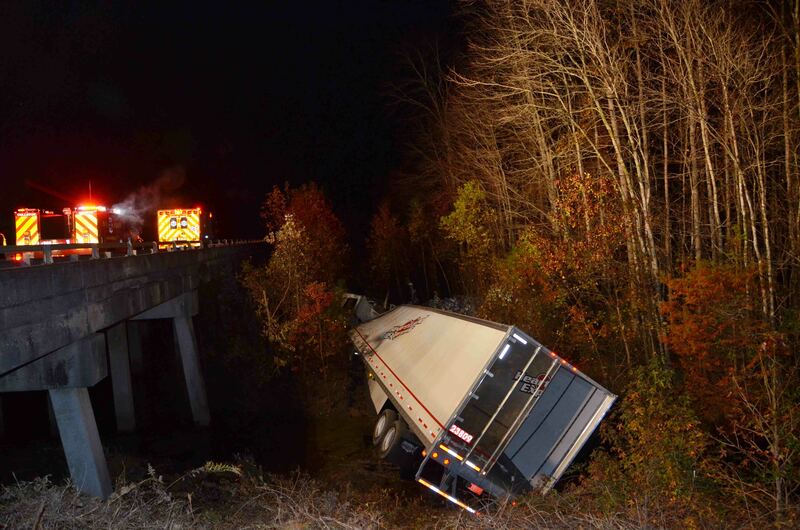 Two northbound tractor trailers collided near the 59 mile marker Tuesday afternoon 13-November at 12:58. According to witnesses, traffic was slowing in the area, when a northbound car carrier traveling at a high speed ran into the back of stopped box style trailer causing heavy damage to both vehicles. 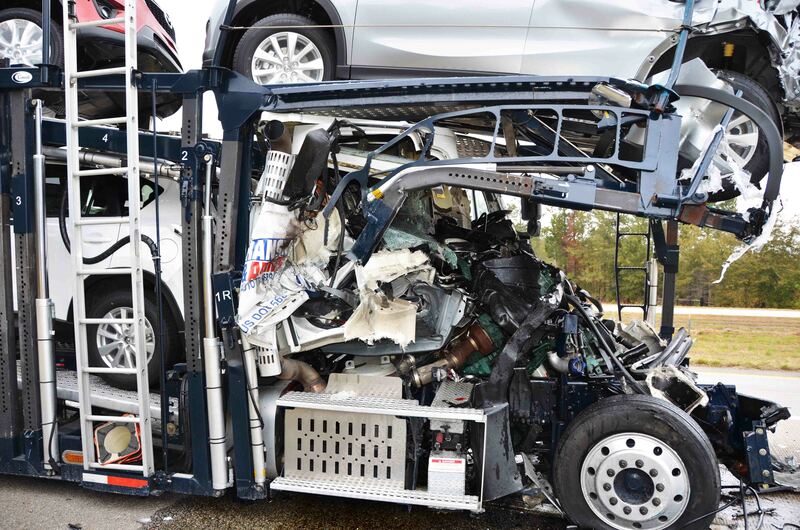 The cab of the car carrier was crushed as the engine was pushed in the passenger compartment. Click here for more information. The northbound lanes of I-95 were closed for over four hours this morning following an accident at Exit 62. At 05:08 this morning(13-November) a northbound tractor trailer left the roadway striking the guard rail before the McLeod Road overpass. The entire rig overturned onto its roof, before striking the bridge abutment. Click here for additional information. Quick action by a homeowner’s son saved a family’s home at 355 Rentz Drive Saturday afternoon 10-November. At 14:32 9-1-1 was notified of a house fire at this location. Engine 1 arrived minutes later to find smoke coming from the eaves and roof vents of the single story brick veneer structure. 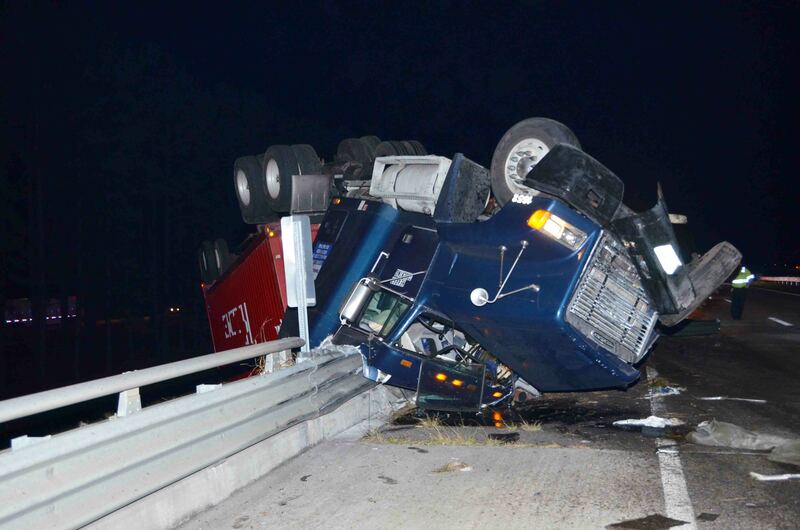 Firefighters deployed one 1-3/4 handline...click here for additional information..
Three tractor trailer trucks were involved in a collision on I-95 at Exit 42, the Lowcountry Highway (US 21) overpass, Saturday morning 10-November at 00:03. Traffic had begun to back up due to an earlier accident at the 40 mile marker southbound. One tractor trailer had stopped near the overpass, when a second truck locked up his wheels and swerved to the left to avoid striking the first truck. Click here for more information. 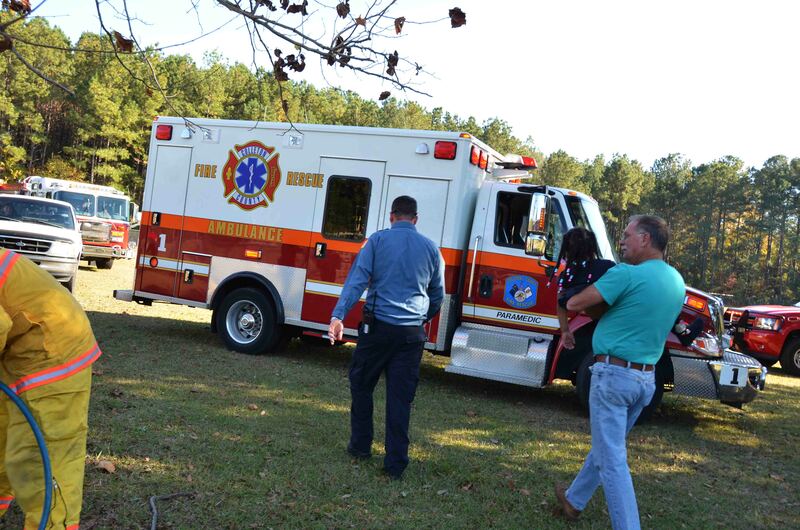 A six year old girl was rescued from a tree Friday afternoon 09-November at the Black Street Early Childhood Development Center located at 256 Smith Street. At 14:19, Fire-Rescue was notified of a child stuck in a tree at the school on the east playground. The girl had climbed the small tree, but slid down in a fork, wedging her leg at the knee. Click here for additional information. 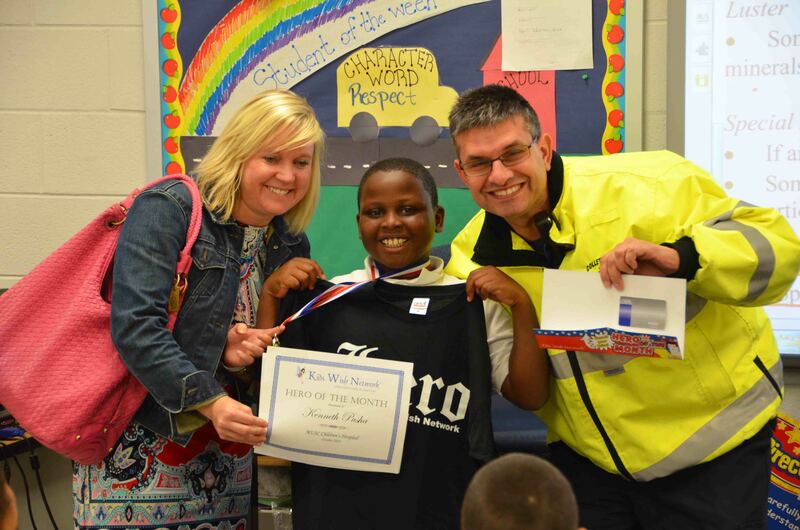 MUSC RN Ryan Curry travelled to Cottageville Elementary School to present the Hero of the Month Award to nine year old Kenneth Pusha. Pusha, a Jacksonboro resident, who was burned on 16-September, was treated and transported to the MUSC Pediatric Trauma Center by Medic 6. Click here for additional information. Due to a low number of registrations, we regret to announce that the Lowcountry Fire and EMS Weekend scheduled for November 17th and 18th has been cancelled. A 27 year old man received life threatening injuries after he was stabbed twice with a large knife at a residence located at 512 Peurifoy Road, Sunday evening 04-November at 23:28. The man was stabbed in his abdomen and leg. Firefighter-Paramedics treated him at the scene, then transported him to Colleton Medical Center. The Sheriff’s Office is investigating the incident. Click here for additional information. Walterboro Public Safety crews requested mutual aid with a single family dwelling fire at 101 Overhill Road, Sunday evening 04-November at 18:13. 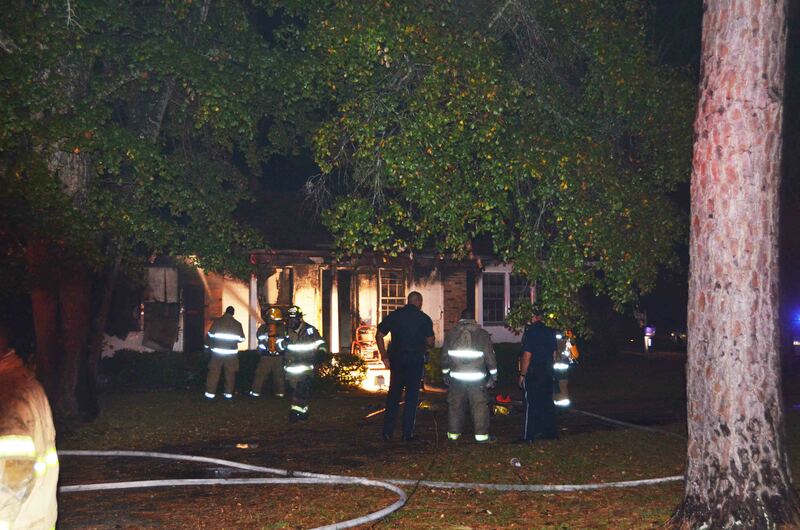 The home was well involved when Walterboro units arrived. They deployed several handlines to quickly bring the fire under control. Due to water supply problems, they requested a Tender to supply a pumper with water. 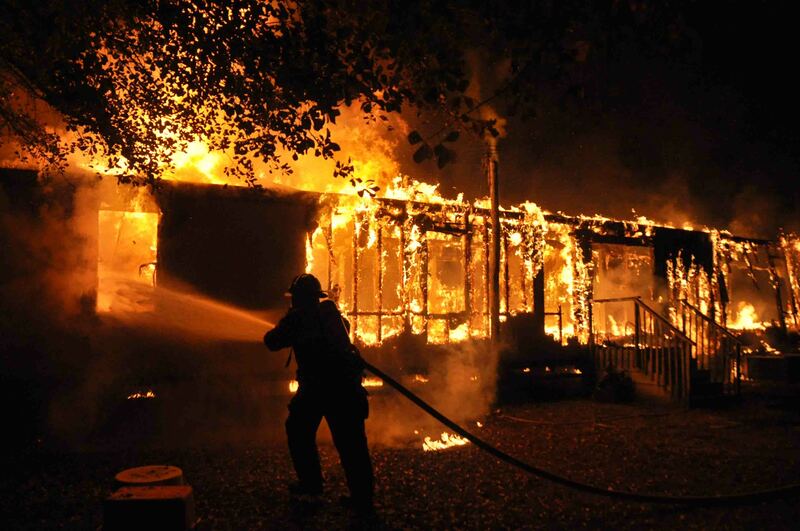 Click here for more information..
A late evening residential fire destroyed a home at 31 Sweetheart Lane Saturday night 03-November. At 21:59, a neighbor reported hearing loud noises outside her residence. Upon investigation, she found the nearby structure on fire. Engine 19 arrived to find the singlewide mobile home 75% involved. The structure had a 12x12 attached addition and wooden rear porch. Click here for additional information. We congratulate Battalion Chief Scott Feather and is wife Melissa on the birth of their fourth child. Eli Mason Feather who was born Saturday afternoon at 15:16. Eli weighed seven pound, four ounces and was 19 inches long. Both mother and baby are doing fine.